Dimethyl Sulfide (DMS) is a sulfur compound produced during fermentation of beer that has the aroma of cooked or creamed corn. As part of my ongoing series on flavors in beer (including the earlier articles Esters in Home Brewed Beer and Judging Beer), we’re going to go into detail this week on DMS. DMS (Dimethyl Sulfide) is a byproduct of mashing and fermentation, so it is present to some degree in all beers. It has the aroma of cooked or creamed corn. Because people can perceive DMS even at very low flavor thresholds (of 10-150 parts per billion) it can have a significant impact on the flavor of finished beer. DMS is primarily found in lagers for a variety of reasons we will discuss shortly. DMS is actually desirable at low levels in many lagers, but excessive levels of DMS will create a strong cooked corn aroma and flavor. German lagers contain the highest DMS concentrations (50-175 parts per billion). American lagers generally contain less than 100 ppb, and British ales contain the lowest concentrations at 10-20 ppb. (Ref: Wikipedia). All malt has in it a chemical called S-Methyl Methionine (SMM) which is responsible for DMS. SMM is an amino acid formed during germination and kilning of barley as part of the malting process. The maltster can reduce SMM by slightly under-modifying the malt, and adjusting the kilning temperatures, but this is largely outside the control of homebrewers. However, two row pale malts have significantly lower SMM levels than six row pale malts, so you can reduce your DMS levels by choosing a two row pale malt base. Also very pale lager malts (such as pilsner malt) tend to have slightly higher SMM levels due to the very low temperatures used in kilning. Heating the SMM present in pale malt will always produce some DMS. During the mashing process (and even the boil), some SMM is broken down into both DMS and a variant of DMS called Dimethyl Sulfoxide (DMSO) which is basically DMS with an oxygen atom attached. So after the mashing process we have wort that contains both DMS and DMSO (as well as some residual SMM). The good news is that DMS itself is very volatile and a lot of it will boil off rapidly when we boil or wort during the brewing process. However DMSO is more stable, and some of it can be converted to DMS during fermenation. Vigorous ale fermentations generally produce less DMS. Finally, infection can produce a DMS like flavor and aroma, though it will generally be an aroma closer to cabbage than corn. If you have a strong cabbage aroma or flavor you may have an infection in your finished beer. DMS is created whenever wort is heated, so some DMS is present in any beer. DMS is created in the mash, however most DMS is evaporated during the boil, so the boil is the primary place to focus if you have a DMS problem. The half-life for DMS is 40 minutes, so half of the DMS will be boiled off in a 40 minute vigorous boil. So if we do the math, a 60 minute boil gets rid of 64.7% of the DMS and a 90 minute boil rids us of 79% of the DMS. That is why most experienced brewers recommend a 90 minute or longer vigorous boil. Since DMS needs to evaporate off during the boil, it is important not to cover your pot. Covering a brew kettle during the boil will prevent the DMS from evaporating and create a beer with much higher levels of DMS. Rapidly cooling your wort after boiling is also important. The SMM to DMS conversion continues at temperatures well below boiling, so DMS is produced even while the wort is cooling after the boil. However, unlike the mash, DMS produced while cooling cannot be boiled off. This conversion continues even if the hot wort is vented. For every hour you have hot wort sitting around, you will produce approximately a 30% increase in DMS. During fermentation, CO2 bubbles actually help remove from DMS from the beer. More vigorous ale yeasts tend to produce lower DMS levels. Also different strains of yeast do tend to produce DMS during fermentation primarily by converting DMSO (which does not boil off) to DMS. Lager yeasts and yeasts fermented at lower temperatures tend to have higher DMS production. Certain wild yeasts and bacteria can create high levels of DMS as well. DMS aromas (including some sulfur or rotten-egg aroma) during fermentation (particularly lagers) are not unusual, so you don’t need to toss your beer out just because you have a DMS aroma during fermentation. Some of this will fade naturally during the lagering process. Finally, beers with robust flavor profiles (dark beers, strong ales, etc) tend to mask the DMS cooked corn flavor with other flavors such as roast, chocolate or caramel malts. Because of this, high DMS levels are most perceivable in lightly flavored beers such as low-adjunct pilsners, many German lagers, continental lagers and extremely light ales. DMS is rarely a problem in beers that are Amber colored or darker, and also rarely an issue with most robust beer styles. If you brew a beer with high DMS levels (creamed corn aroma) take a close look at the suggestions above, and focus on your boil, as that is where DMS can be most easily controlled. Thanks for joining me on the BeerSmith blog. Check out my podcast or email list for more great brewing material! I wonder now about people who tout the “no chill” method and if there is more noticeable DMS in their beers. Great post and very informative. Has any homebrewer tried carbon dioxide sparging during boiling for increased volatile stripping while reducing energy demands, oxidation and colour formation associated with longer boils? I’m sure a soda-stream bottle with a regulator, non-return valve and a homemade sparge ring could work wonders! Just a thought. Great blog! So, the 24 hours that it takes the wort to cool in my no-chill cube actually increases my DMS levels by 720% ? Please, Brad, stop perpetuating the “You have to cool your wort as quickly as possible or the DMS boogie man will wreck your beer” myth. Don’t believe me? Please try no-chill for yourself and then get back to us. Todd – Actually what I said is true – DMS production continues at mash temperatures (down below 140F – I don’t recall the exact cutoff temperature) at a rate of about 30% per hour, so if you leave hot wort sitting around in the kettle it will continue to produce DMS that will not have a chance to boil off. Now it won’t reach 720% because you won’t be in mash temperature range that entire time. I don’t know how fast the average “no-chill” cube takes to get down to the 100-110F temperature range, but somewhere around there DMS will stop being created. If it takes an hour, you will have about 30% more DMS, two hours will have about 70% more and so on. You may not perceive the extra DMS in most beers – it is a bigger problem in very light lagers, but would be well below perception threshold in English ales, stouts or porters for example. Also if you did a proper long vigorous boil it may not be a big deal as your starting DMS level is low. Finally – I don’t have anything against no-chill brewing. I encourage people to experiment with many techniques – and if no-chill suits your lifestyle and beer styles then keep on doing it. Really appreciate these articles — detailed, and well-explained. I let my wort cool overnight in a steel turkey fryer kettle, and I have yet to perceive or taste any DMS. Of course, I am not certain what taste I am looking for. Maybe it is there, I’m not sure, but I’ve made some decent beers at home so far. I boil my wort which usually has 50 to say 75 percent pilsner malt for about 1 hour only typically, but it takes several hours to cool, so I throw some tin foil over it, then put the lid on, and let it sit for the night because I don’t like playing around with hot wort, and I don’t have a wort chiller. Oh course, I am limited to using ale or wine yeast due to my location being in the deep south (could this be a factor?). DMS is also highly style dependent. Even if present, it will not be noticed in darker/more robust beers. You would most likely see it in a very pale pilsner or other very light flavored lager. I know a lot of people use “no chill” options and store their wort in a cube overnight. This may work fine – it depends on how long you boiled it, and also what style you are brewing. I think the reason that so many people don’t have problems with DMS is because it evaporates at 99 degrees F. (MSDS Dimethyl Sulfide http://www.gaylordchemical.com/index.php?page=msds-dms) So even a slowly cooling wort is still evaporating DMS, and if it’s cooling all night long that’s just more time to evaporate DMS as long as the wort stays warmer than 99 degrees. Maybe the DMS myth has been perpetuated because some bacteria may give off a flavor that tastes a lot like cooked corn. The main reason for boiling your wort is sterilization. However, it’s not for water sterilization; it’s for wort sterilization. Many grains obtain bacteria after milling, of particular concern is lactobacillus which can be difficult to kill and can survive the mashing process. 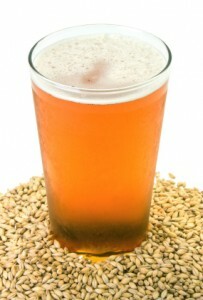 (Quantitative and qualitative studies of the microflora of barley malt production http://onlinelibrary.wiley.com/doi/10.1111/j.1365-2672.1988.tb01895.x/abstract) However, a temperature of 140 degrees for just a few minutes seems to be enough to kill Lactobacillus paracasei and Aspergillus niger in Pilsen beer. (http://www.sciencedirect.com/science/article/pii/S0260877404001360). Lactobacillus is everywhere and likes growing at 99 degrees. Maybe it’s not the slow cooling of wort causing DMS off-flavors, but the amount of time that a wort has between 99 and fermenting temperature causing a fantastic growth medium for bacteria that is a problem with slow wort cooling? Also some bacteria such as Pediococcus are rarely found in top fermenting breweries and are mostly found in bottom fermenting breweries. (Food Industries Manual. Search the book for lactobacillus: http://books.google.com/books?hl=en&lr=&id=iG3wx9Wh5N4C&oi=fnd&pg=PP11&dq=how+to+kill+Lactobacillus+with+boil&ots=Vgh2q24Fa3&sig=CBDABzqetmIRnWZl7so89fLUxLE#v=onepage&q=lactobacillus&f=false) Perhaps, this can contribute to more off flavors in lagers? Whatever the case, the off flavors are not likely caused by DMS so we can all relax. Is it possible for this off taste to occur when using an ale yeast at low temps? I brewed a saison but with the summer AC, my basement where I ferment gets cold, like 62. Would that low temp contribute to the creamed corn flavor? Once you get this result can it be removed, or is it a wasted batch? Could I re-boil to remove the flavor? Excellent article. Straight forward and to point. You explained the cause and multiple solutions. Thanks! I am a Process Engineer at (name withheld) and yes, we are strippinv off DMS with CO2 and we have achieved an energy saving of 50% on the Kettle. Gas sparging is the way to go. is less than the 50% reduction in BTU’s used. Does it somehow contribute to carbonization of the final product ? Any chance I could get the dope on Gas sparging. Great article, thanks for posting. Is there a way to minimize DMSO production? I make low gravity, pale, English all-grain bottle-conditioned beers of below 4% alcohol: light, bitter and hoppy. From what you have said, that might present DMS problems. I’ve always kept the lid on a 90 minute boil in a plastic boiling bin with a small hole in the lid for venting. It helps make a more energy efficient boil and avoids clouds of steam in the kitchen. I don’t cool the wort, other than make the volume back up with cold water after the boil. I have no need to reduce volume of the wort from the original as it is the right specific gravity to start with..about 1.035. I just leave the wort to cool overnight before starting fermentation the next day. I’ve never noticed any off-flavours in my finished bottles of ale. The beer tastes clean and flavoursome. I do often pick up unwanted caramel-type after-tastes from shop-bought bottles of beer …it could actually be due to added caramel colour/sweetness rather than due to dimethyl sulphide. I don’t add any additional sugars to any of my brews…just pale malt and about 10% crystal malt, plus a small amount of wheat and rye malt. DMS boils at 37C (99F) according to wiki, so I would have thought it should still be boiling off as low as blood heat, not increasing as it cools. Not sure what “no-chill” is all about, but I brew in a 14 litre kettle and after my typical 75 min. boil, there is only about 10 litres of wort left, so I top up with 4 litres of cold water and this brings the temp down well below boiling in a hurry. I tried ice one time but it didn’t seem to cool things any quicker so I am back to water. I will let my kettle sit overnight with the lid on and the next morning it the wort is usually about 35 C. Never had a problem with DMS flavours although I usually brew stouts and ambers, although I do some pale rice ales and they never have problems either. I boil my hops, combined with a partial mash, in a small quantity of water (about half a gallon) in a kitchen pressure cooker. In a pressure cooker the temperature raises considerably above 100 C.
As I see it, this will eliminate the DMS is a fraction of the time. In addition, this results in considerable energy saving. Plus, cooling is very quick and easy because I top up with water from the faucet. By this time the temperature is down, and ready for the yeast to be added straight away. Brewing the Perfect Lager at Home | Drinking Beer Inc! 6 Essential Things You Need to Know before the Boil - Grizzly Bear Loves Kölsch.